Note: Newsletter sent to my subscribers on 28-Sep-2015. Please subscribe now at the end of the page if you have not subscribed. 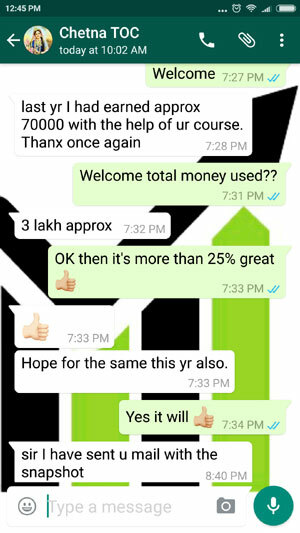 Read to know what to trade tomorrow. Tomorrow at 11 am RBI will announce their policy. Markets expects a 25 basis point cut in the repo rate. Looks like this will happen. When markets expect something and the same thing happens, unless it isn’t something major, markets do not react OR react on just the same day. From day after tomorrow they will react to global news. Which means the movement to the news will be restricted to trading day tomorrow if 25 basis point cut in the repo rate is announced. So please trade this at your own risk. VIX will fall after 11. It will be high till that time. Take this trade after 11 am – preferably around 11.30 to 12. Let it take direction – go with the flow. We are least bothered how markets will behave – we just want to go with the flow. 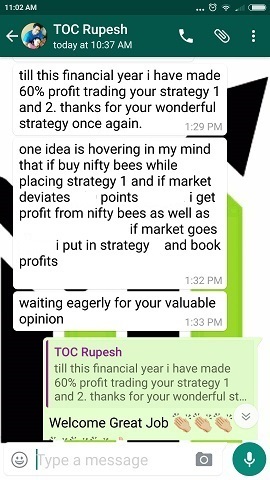 If Nifty is going south (down) – Sell ATM Call & buy OTM Call (decide your own strike based on risk tolerance). People who have taken my course know which strike to choose – stick to that. When to close in profits? 2. Set a target of 5-7 points and get out. When to take a Stop Loss? Since the trade is hedged – just close it at 3.15 pm (If its MIS the risk management software will close it anyway at 3.15 pm). No major loss is guaranteed. If there is no movement there is no trade. VERY IMPORTANT: I am helping you for free. Please do not WhatsApp me and tell your trades. I may not reply. You are getting more than what you pay to tips providers for free, so please respect my time. I get too many messages on WhatsApp ON what to trade tomorrow. I am sorry but I do not trade for few hours. I know one day’s trade will not make me rich. But a few trades over the years will. Let me know the results in comments. 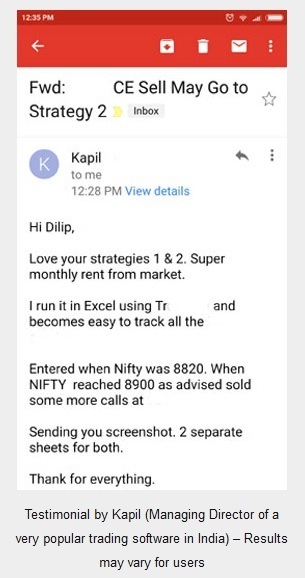 Taking a loss is ok, but taking a big loss is not at all ok.
One dayâ€™s trade will not make me rich. But a few trades over the years will. That’s very true Sir. People do not understand. 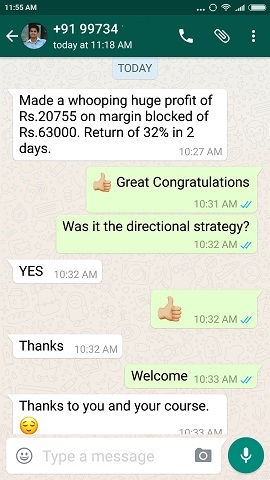 Still I get WhatsApp message on what is the best Intraday trade today. They do not understand one trade cannot change their life. Thanks.